Navajo code talkers were recognized more than a decade ago for their service in World War II. They used their Native language as a code that the enemy was never able to crack, but until recently, no one knew that Tlingits from Southeast Alaska also served as code talkers. 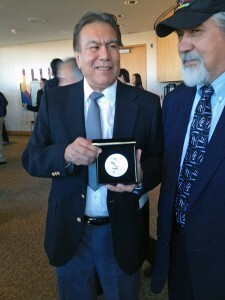 Ozzie Sheakley hold the Congressional Gold Medal awarded to the Tlingit Tribe for code talking service during World War II. He speaks to Sens. Lisa Murkowski and Mark Begich after the ceremony. Photo by Liz Ruskin, APRN – Washington DC. They got their due Wednesday when Congress awarded a gold medal to the Tlingit and Haida Central Council. Much of their story remains a mystery. Robert Jeff David Senior of Haines was a basketball legend in Southeast, a top fisherman and one of the first Sealaska board members. Charismatic and confident, he wasn’t one to keep his mouth shut when he had something to brag about. But his son, Jeff Jr., says he never said much about his service in the war. Jeff Junior says he only learned a few weeks ago that his dad, who died in the 1980s, was a Tlingit code talker. 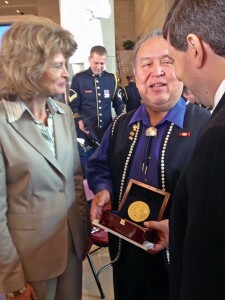 At a Congressional ceremony attended by hundreds today, the Tlingits and 32 other tribes received congressional gold medals for their service to the nation as code talkers. They worked in pairs, usually over a radio. During 48 hours on Iwo Jima, they say, 800 Native-language battle communications were received and translated. It took seconds, at a time when decoding by machine could take half an hour. House speaker John Boehner said the men undoubtedly saved lives. “And after serving with honor they did the honorable thing, they kept their service a secret – even to those that they loved,” Boehner said. Robert “Jeff” David Jr., left, holds the silver medal awarded to his dad, who the family just learned was a code talker. David, of Haines, traveled to Washington, DC with former legislator Bill Thomas. Photo by Liz Ruskin, APRN – Washington DC. The Defense Department declassified the Navajo program only in 1968. No one apparently, told Jeff David of Haines he could finally tell his story. Former State Legislator Bill Thomas heard a few years ago the Defense Department was researching Tlingit code talkers. A few weeks ago he learned his old friend “Big Jeff” was one of them. Exactly what he did still isn’t known. Thomas says one of the mysteries is how the outspoken Jeff Sr. was able to keep quiet about it. 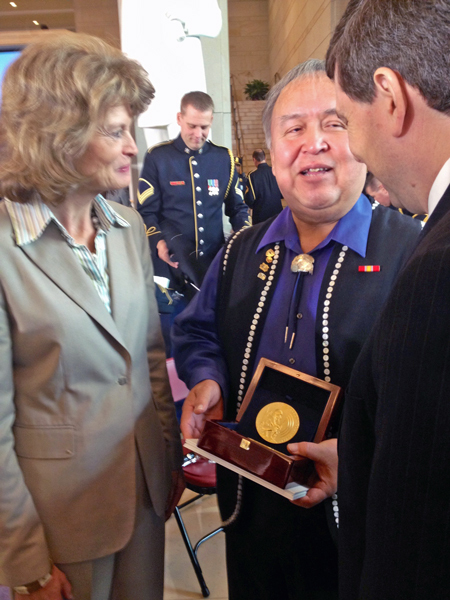 Ozzie Sheakley received the Congressional Gold medal, on behalf of the Central Council of Tlingit and Haida. Five individual Tlingit men, all deceased, were honored with silver medals. They are Jeff David, Richard Bean Sr., George Lewis, and brothers Harvey Jacobs and Mark Jacobs Senior. A little more of the service history is known of the Jacobs, who were from Sitka and Angoon. According to a history published in 2008, the brothers joined the Navy and skipped basic training to serve on picket boats, first in Southeast Alaska and the Aleutians, then in the South Pacific.